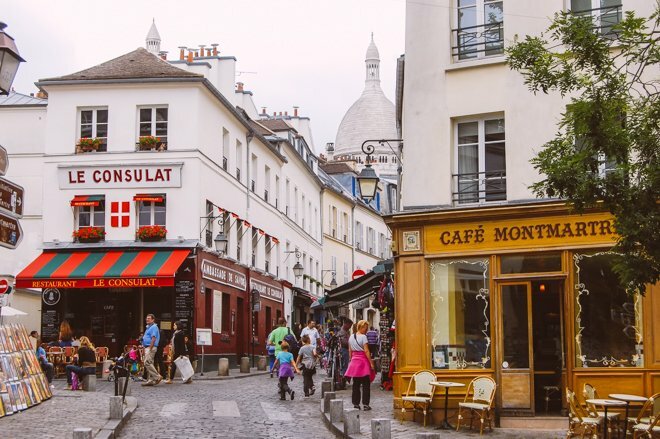 Exploring Montmartre gives you a taste of the old world. The neighborhood’s cobblestoned streets twist and turn, surprising you with a street musician, dancer or artist hiding around every corner. These are the streets of the cabaret-loving, “starving artists:” The struggling painters, writers and poets of the Belle Époque, such as Toulouse-Lautrec, Paul Verlaine and for a short time, Van Gogh. In the days before their art became world-renowned, they first ate at the cheap cafés of this Bohemian quartier. 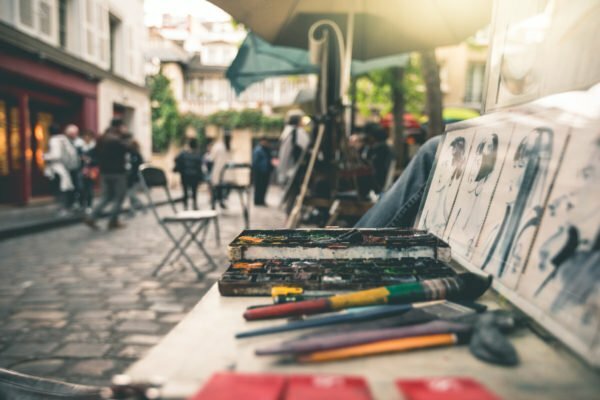 These days, even though a large part of the neighborhood has been overcome with tourism, you can still find quirky little restaurants and lots of fun shopping boutiques. 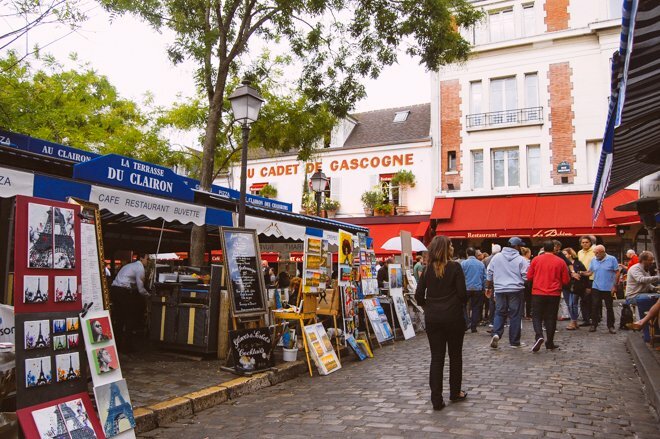 Here’s a short guide to Montmartre to get you started. First up, restaurants! 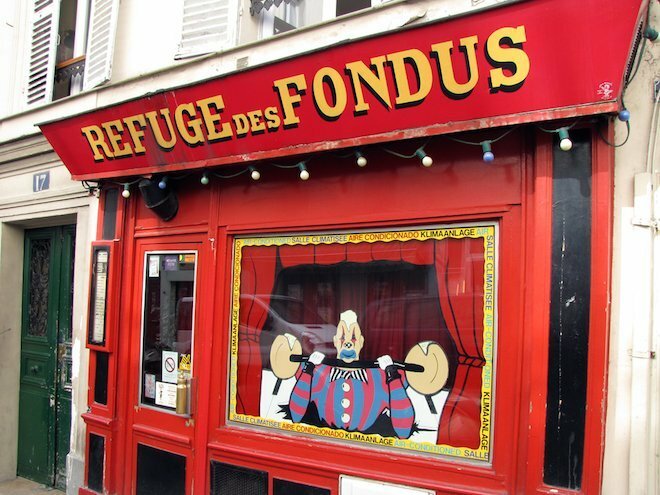 If you’re looking for a truly unique dining experience in Paris, make a beeline straight for Le Refuge des Fondus. The exterior, like the rest of the street, is quite quirky, bordering on zany. The interior is tiny, only allowing two long tables, one on each wall. Those sitting by the wall will have to climb over the table, courteously aided by the sassy owner – but don’t be put off by him, he loves to joke around! You’ll be munching communal-stye, elbow to elbow with other travelers and Parisians. The specialty, and only option here, is fondue. You can choose from a meat or cheese fondue, both of which come with an appetizer of olives, cheeses and charcuteries. There’s also a simple choice between wines: red or white, which is delivered to you in a baby bottle complete with a rubber top! Supposedly, these imaginative Parisian owners found a loophole around the city alcohol tax reserved for long-stemmed wine drinking. The fondue is delicious, the bread is never ending and the wine keeps flowing, with no risk of spillage, thanks to those baby bottles. Come hungry and ready for a raucous time! If you love fried, perfectly crispy garlic potatoes, you have to come here. The highlights of their menu are the “giant salads,” all topped with a generous helping of the divine spuds. It may not look like there’s a salad hiding underneath the mountain of potatoes, but we promise, the lettuce is there, along with other delicious additions like warm goat’s cheese, bacon and a sprinkling of other vegetables. The value for money here is unbeatable, but be sure to bring cash, since they don’t accept credit cards. 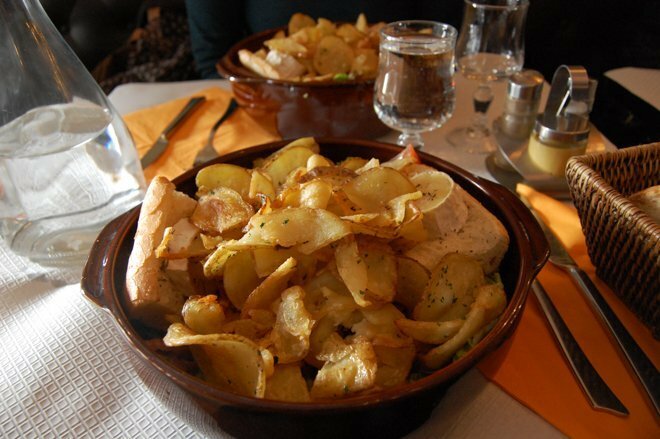 France – the land of rich creams and meats – does not offer a lot when it comes to vegetarian options. 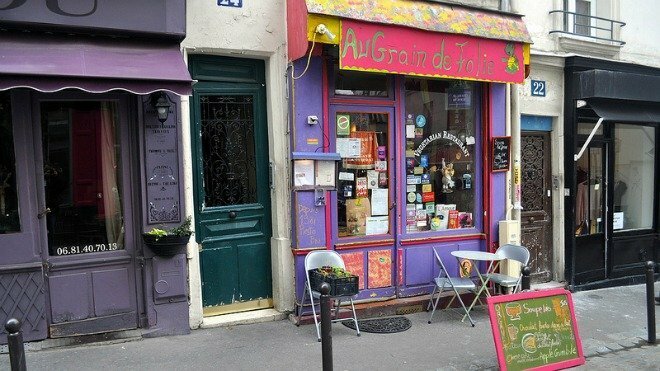 However, this little gem up the hill and east of metro stop Abbesses brings all the quirk and appeal a vegetarian restaurant in Montmartre warrants. The outside is painted in fun purples and pinks, the interior is comfy, intimate and charmingly mis-matched, like someone’s living room. In fact, on slow days, the owner herself acts as both your waitress and cook, so it really is like coming to a friend’s house for lunch! They prepare the vegetarian food at a station just ten feet away from the table; you can see and smell everything. And the food: simple and hearty lentils, grains, vegetables and hummus, things which are typically unavailable at the average French bistro or restaurant. A guide to Montmartre would be incomplete without a few bakeries. Sure, you can get a great baguette anywhere in Paris, but because the baguette is a national treasure, the city has formed a bread ranking system. Since 2008, bakeries in Montmartre have won the title of “best baguette” more than any other quartier in Paris: the best, most artisanal carbohydrate swords are found in this hilly village! Check out a few of the ranked boulangeries below for crunchy, savory baguettes or something to quell your sweet tooth. Coquelicot des Abbesses at 24 rue des Abbesses (pictured above); this one comes with a double-level dining room for in-house brunch! Boulangerie Alexine at 40 rue Lepic; ranked in the top ten of Parisian baguettes in both 2007 and 2008. Now that we’ve made you sufficiently hungry, let’s move on to some shopping in our guide to Montmartre. For all the cult beauty disciples out there, this baby-pink boutique boasts the best selection of small, specialty beauty brands such as Sunday Riley, Antipodes, Pai and Tata Harper. You’ll find truly unique products here, filled with all-natural and revolutionary ingredients that are more potent than your average face cream. Whatever skin you have – normal, dry, oily, combination, sensitive, dull, red or hyper-pigmented – there’s a rockstar product here to fit. You’ll be able to spot this ceramic shop from a mile away. 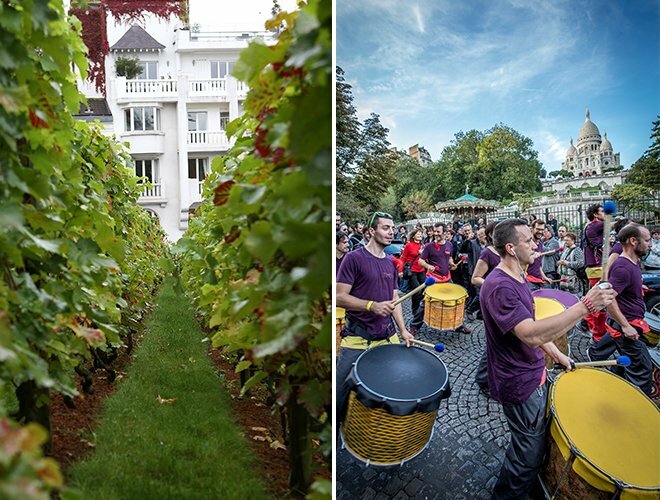 It’s nestled into the slope of rue des Saules, which leads down to the Montmartre vineyard, the famous pink Maison Rose and the old cabaret Au Lapin Agile. Step inside and you’ll be surrounded by ceramic cups, bowls, plates, pots and even hanging ornaments in a range of different colors. The style is distinct and unmistakable, with a modernist shapes and motifs, but with a slightly rough texture. These would make wonderful gifts for loved ones back home! 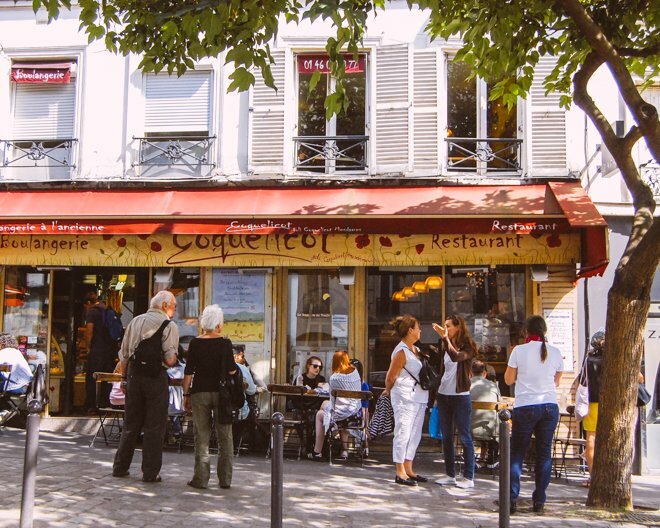 Wake up early on a Sunday, grab breakfast or simply a coffee and croissant at Coquelicot des Abbesses, and stroll over to Place des Abbesses. The square will be lined with heaping tables full of knick-knacks and treasures to discover. Old doorknobs, spoons, books, vintage postcards and more are waiting for lazy perusal. Modern Parisian jewelry artists also set up the shop here. Place des Abbesses, at the metro stop Abbesses. 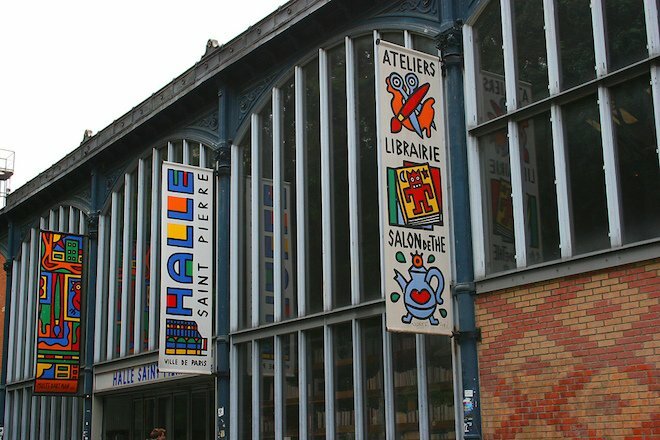 The Halle Saint-Pierre is situated just beneath the great Sacré-Coeur and the Butte Montmartre gardens. The round building creates a safe-haven for various modern art exhibits. It holds a wonderful library with books that capture all the essence of the Paris’ most magical Montmartre years, perfect for souvenirs. Naturally, the Halle Saint-Pierre also houses a well-established, ultra-modern café with all the croissants, pain au chocolat and coffee you could need. Check out their website for current exhibits: www.hallesaintpierre.org. If this guide to Montmartre appeals to your inner Bohemian self, then why not stay a week or two in our Montmartre apartment? We are currently giving away free nights for autumn stays in 2015! See this blog post for all the details. PREVIOUS: A Brilliant New Addition to the Parisian Food Scene! NEXT: Celebrate the Changing of Seasons with a Paris Picnic! Posted on Tuesday, September 8th, 2015 at 11:48 am in See & Do. You can follow any responses to this entry through the RSS 2.0 feed. You can leave a response, or trackback from your own site. 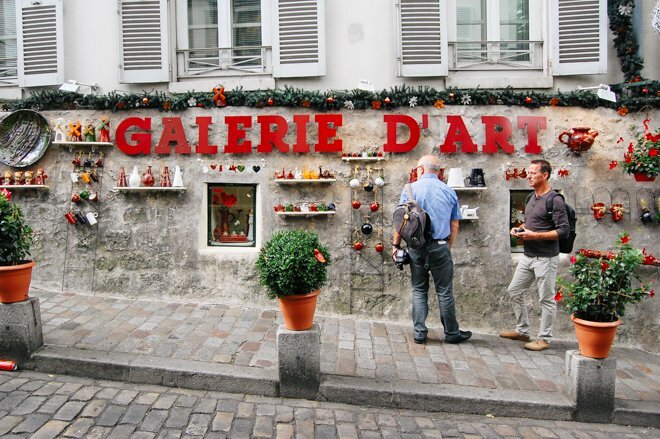 Secret Montmartre: An Insider’s Guide Soldes in France: Guide to Shopping the Biannual Sales in Paris Dining Guide for Celebrating Christmas & New Year’s in Paris – 2013 Don’t Miss Out on the Fun of Montmartre’s Harvest Festival!